The new Ford Kuga Diesel Estate needed to be given a style makeover in order to keep it nice and competitive, and fortunately, Ford has done just that. It looks fresher, comes powered by a range of economical engines and is fairly priced. However, despite updates to its exterior, its dashboard still looks dated. Four-wheel drive remains an optional extra, and its automatic gearbox isn’t the best. 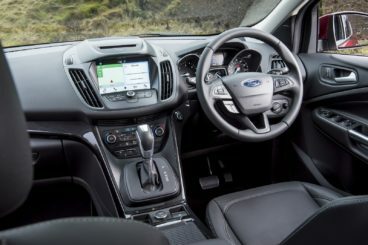 OSV takes a closer look at what it’s all about with our 2018 Ford Kuga Diesel Estate review. The Kuga is smartly put together, comfortable and well-insulated. Engine and road noise is impressively suppressed, although wind noise does seep into the cabin when you’re out on the motorway. Ride quality is generally good, even with the larger alloys, but the interior design isn’t as modern as the car’s rivals. We can’t argue too much with the quality on display, but when you compare this cabin to a top-notch competitor, you notice its deficiencies. The materials are okay, and there are even some tactile plastics here and there. But there are also harder plastics, too. In terms of its engines, there are two diesels to choose from. The smallest in the range is a 1.5-litre unit that develops 118bhp. It has a 0-62 time of 12.8 seconds, but we fear that its power output just won’t be enough for a car like this. Front-wheel-drive is standard, and we recommend overlooking it in favour of the 2.0-litre diesel. This 2.0-litre power plant is available in two separate guises. The smallest variant develops 148bhp and the biggest variant develops 178bhp. The former comes with two-wheel-drive as standard but four-wheel-drive can be specified, while the latter is four-wheel-drive only. The 2.0-litre engine is the most popular in the range. Whichever variant you go for, both of them are powerful and efficient, smooth and fairly quiet. However, they can be mated to a 6-speed PowerShift automatic gearbox that finds it hard to pick the right gear at low speeds. When cruising, it’s much better. In terms of the numbers, the 148bhp variant can propel you from rest to 62mph in 10.1 seconds and has lots of pulling power in reserve. The bigger variant, meanwhile, hauls you from a standstill to 62mph in 9.2 seconds. The dashboard is a bit of a problem. Its controls are logically arranged, but there are still too many of them. The switchgear, meanwhile, looks dated. Ford’s updated SYNC3 infotainment system comes as standard on all but the entry level model. It includes a voice-activation system and its display screens are super easy to read. 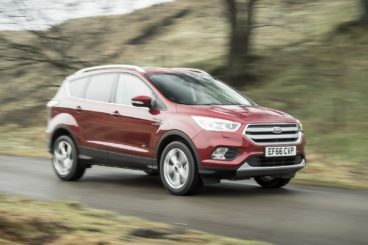 Is the Ford Kuga Diesel Estate practical? Ford has increased its dimensions so that it can accommodate your passengers a bit better. Its boot has also grown in size. Head and legroom are just fine in the rear, where three adults should be able to sit in comfort on longer trips. We’d argue that there are definitely cars with more interior space than the Kuga, but it doesn’t fare too badly on this front. Moreover, headroom is among the best in class. Storage spaces are good and include a large centre cubby and an enormous glovebox. The boot, meanwhile, now measures 456-litres and can be extended to 1,603. Its wide opening and low floor make it very user-friendly. Prices for the new car start out from £22,595 and rise to £36,095. For more information on our leasing deals, you can check out our page here. In terms of its running costs, there are three diesels on offer and they’re all relatively inexpensive to run. The most frugal is the 1.5-litre diesel, which can manage 64.2mpg on a good day. 148bhp variant of the 2.0-litre engine, however, is our top pick. It can return 60.1mpg on a good day and emits 122g/km of CO2. This qualifies it for a BiK rating of 24%. The bigger version of the 2.0-litre diesel, meanwhile, comes with four-wheel-drive as standard, and this helps to peg its economy at 54.3mpg. It’s not normal for a Ford to not be the best car to drive in its sector, but that’s the case here. Still, the Kuga is decent to drive. The Zetec is now the entry-level model, and this ensures that all models are well kitted out. There’s enough interior space in here to keep all your passengers satisfied. It looks cheap and old in places and doesn’t stand up well compared to rivals. Comparatively speaking, the Kuga’s 456-litre boot can be considered small for this class. The new Mazda CX5 is a fine all-rounder. It handles well, looks good and doesn’t cost much to run. Stylish and spirited, it’s a great car to drive that’s edged out the Ford for pure driver enjoyment. It even reminds us a tad of the Mazda MX5 Roadster – or are we getting carried away? The steering is nicely weighted, the gearbox is tight and accurate, and the engines are strong and responsive. All in all, its on-the-road performance is thoroughly engaging and satisfying. Specifying four-wheel-drive and the automatic transmission can take something away from the experience, however. In terms of its engines, the 2.2-litre diesel is available with two separate power outputs. The smallest of the two develops a respectable 148bhp, which makes it considerably bigger than Ford’s entry-level engine. You can choose between a manual or an automatic and two or four-wheel-drive, and it’s got enough in its tank to whizz you from a standstill to 62mph in 9.4 seconds. The bigger diesel, meanwhile, develops 173bhp. It’s not available with the lower-spec models, gets four-wheel-drive as standard, and completes the 0-62 sprint in 9.0 seconds flat. Running costs? The two-wheel-drive, manual variant of the 148bhp variant can return 56.5mpg at best, which we think is great for such a bulky car. Specifying the automatic ‘box knocks those numbers down to 50.4mpg. The bigger engine offers more performance, and when paired up with the manual transmission it can return 52.3mpg – which is very good. Inside, the CX5 is comfortable, quiet and smart. However, quality is far from the best. Getting comfy is easy, visibility is good and the CX5 makes for an excellent cruiser. But the question marks that hang over quality and design aren’t going away. Dark plastics create a bland, unwelcoming atmosphere, and while the dashboard is robust and solid enough, it lacks the freshness that many rivals have. 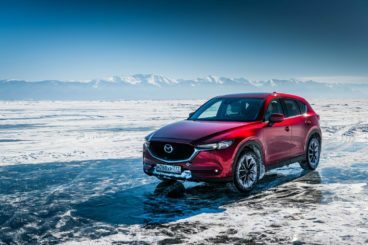 Is the Mazda CX5 practical? Reasonably so. It actually isn’t much bigger than the Mazda3, but head and legroom is good for all but four rather than five adults are better suited to the car. There’s a number of storage spaces here and there – though you might wish there were more – while the boot measures 503-litres. That’s significantly bigger than the Ford. The new Skoda Kodiaq is an excellent seven-seater that offers plenty of value for money. On the road, it’s not as exciting as the Mazda but it can offer a very enjoyable driving experience. It’s competent enough, and its precise steering makes it easy for you to place it on the road. Body roll is well resisted, and the Kodiaq is just as much fun as the Ford in 2018. Despite its newfound sense of adventure, it’s also comfortable. It’s perhaps not the smoothest of the smooth, but we’ve got few complaints on this front. In terms of its engines, VW Group has blessed it with their sophisticated 2.0-litre diesels. The smaller variant develops 148bhp and can cover the 0-62 dash in 9.8 seconds. It’s got enough punch to deal with steeper ascends and it’s our top pick. The bigger 2.0-litre diesel develops 188bhp and covers the same sprint in just 8.3 seconds. That’s incredibly fast for a car of this type. Skoda says a 113bhp variant is in the works, but anything with a power output below 148bhp is worth avoiding in this market. Running costs? The 2.0-litre 148bhp diesel can return 56.5mpg on a good day, which is competitive in this class. It emits 131g/km of CO2 but adding four-wheel-drive will bring its economy down to sub-50mpg. The bigger diesel is slightly less economical but both benefit from selective catalytic reduction which helps to keep harmful emissions down. Inside, the Kodiaq is defined by sound ergonomics, superb build quality and a tastefully designed dashboard. We wouldn’t say there’s anything revolutionary about this cabin, and how it’s all put together is probably its strongest suit. But it’s a cabin that’s a great place to spend your time out on the road. Insulation is fab, ride quality is good, and a glass-fronted 8” infotainment touchscreen is very classy. 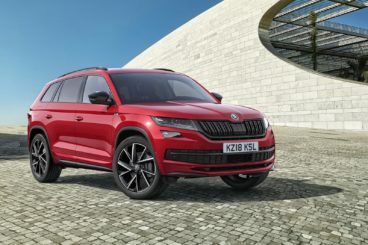 Is the Skoda Kodiaq practical? It’s one of the most usable cars around. The cabin is vast, five adults can sit comfortably on longer trips, and there are all kinds of clever practical touches to be found. These include plastic flaps that help you to avoid car park dings and cup holders that are so grippy you can remove them with one hand. The boot, meanwhile, measures a quite frankly 720-litres with all five seats up. Fold the rear seats and you can extend it to 2,005-litres. The Kuga is now in its second generation, but buyers might complain that it still looks dated. That’s true of its interior, where cheap plastics and a relatively small boot are the biggest stains on its copybook. In fact, they’re the only stains on its copybook and apart from that, the new Ford Kuga Diesel Estate is a very capable crossover.